As part of our ongoing effort to disentangle ourselves from the American Airlines frequent flyer program (which has gone from excellent to sucktastic in the past couple of years) Jeri and I had a few upgrades we needed to use before the end of the calendar year before they evaporate. These allow us to purchase relatively cheap coach tickets and then get free upgrades into Business class. Given the um…..challenges of actually using these upgrades on American these days, we limited our focus to nonstops out of Los Angeles. 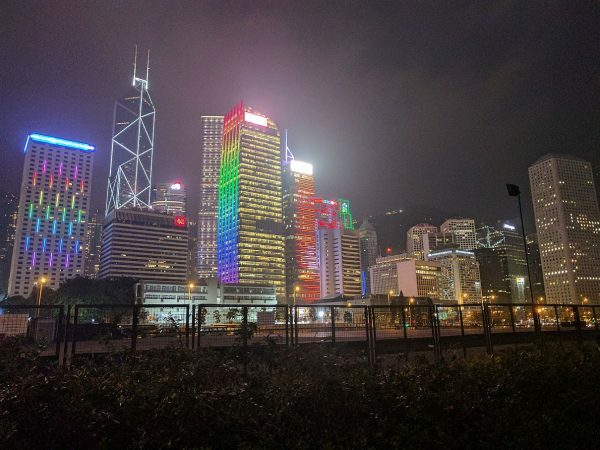 After a bit of hunting, it looked like a trip to Hong Kong was our best use. We’d never been there, and it was sorta China. We had also heard that due to its history as a former British colony it was very “western”, and given our shallow travel sensibilities that sounded rather good. After a very long 15 hour flight, we landed at the Hong Kong airport around 8 AM. 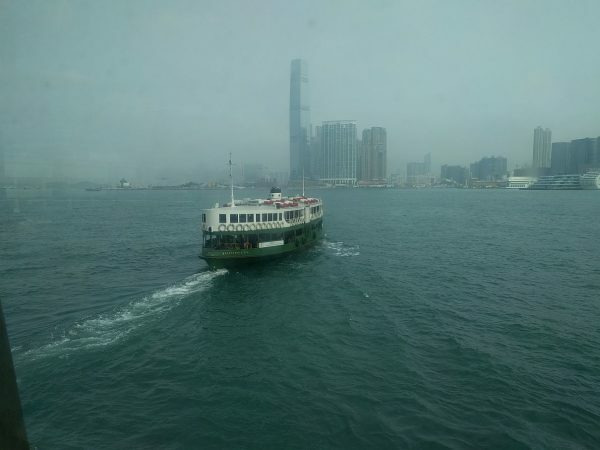 Since all the transit in Hong Kong runs on prepaid smart cards called Octopus cards, we killed some time at the airport picking those up, then boarded a sparkling train that took us to Hong Kong Central Station on Hong Kong Island in only 24 minutes. 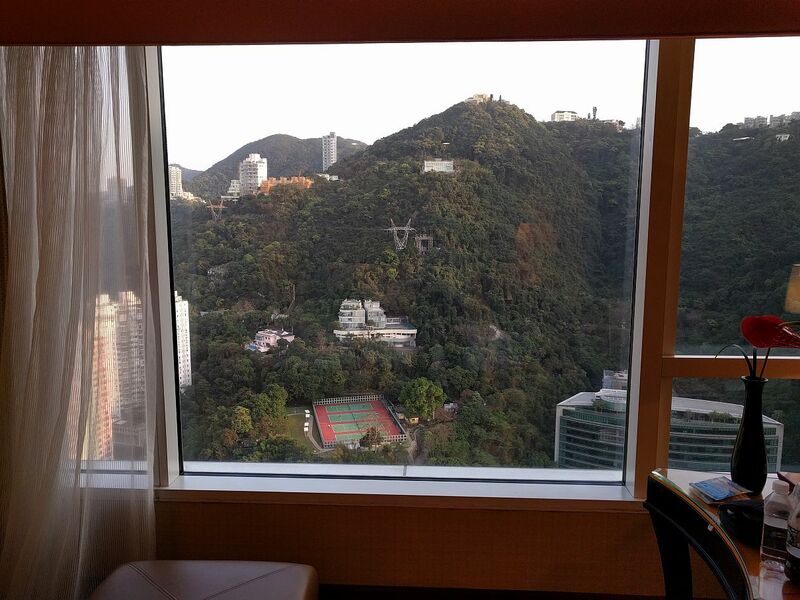 From there we grabbed a free shuttle to our hotel for five nights, the Conrad Hong Kong. The view out of our room at the Conrad. While we were facing away from the harbor, this was a more soothing view. Usually, a place like the Conrad is far above the sort of places we usually stay. However using Hilton points I was able to book us into the Conrad Hong Kong, at a really decent cash-equivalent price. And since I have status with the Hilton chain (ain’t I fancy? 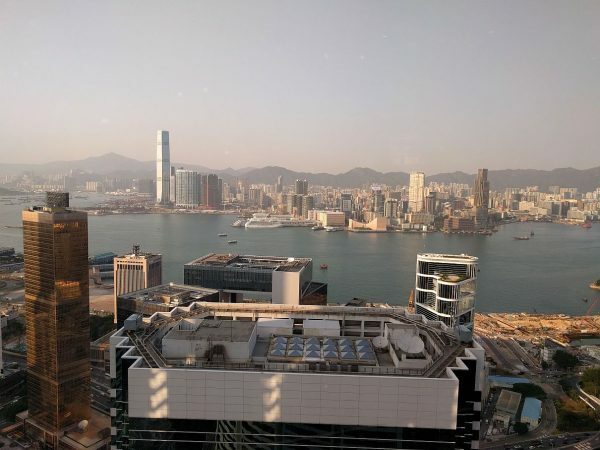 ), we were able to get a room upgrade, free breakfasts and access to the Conrad’s executive lounge on the 59th floor (for more free food and drinks…see a pattern?). 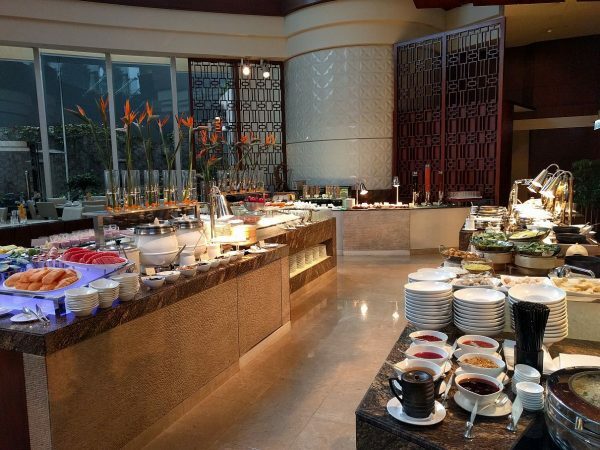 Between all the free food we had available, we only paid for a meal once during our trip. Strangely, what was probably our most upscale trip ever ended up as being one of the cheapest yet. I doubt we’ll often be that lucky. Just a portion of the breakfast buffet at the Conrad, which quickly became our main meal of the day! A view of Victoria Harbour from the Conrad’s Executive Lounge (free food/drinks!! ), a location we spent much time. 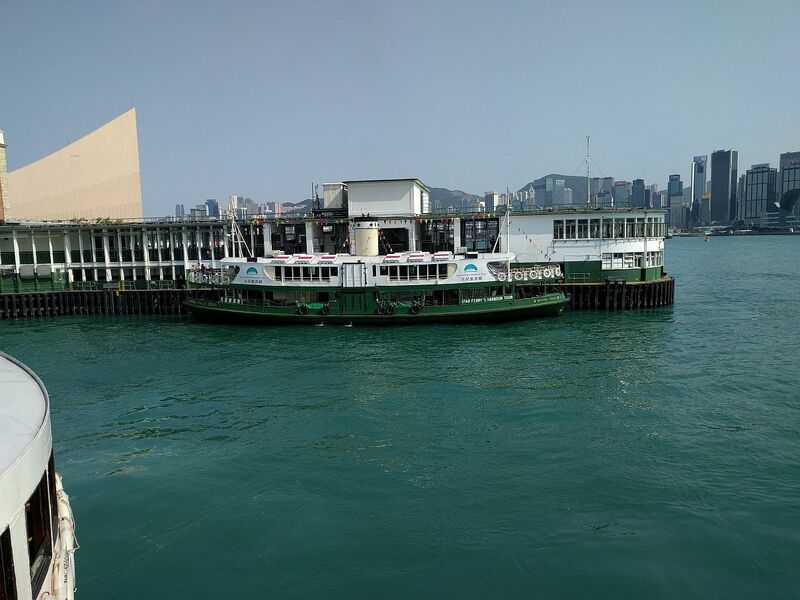 Two Star Ferries are visible making their crossings in the left-middle of the picture. 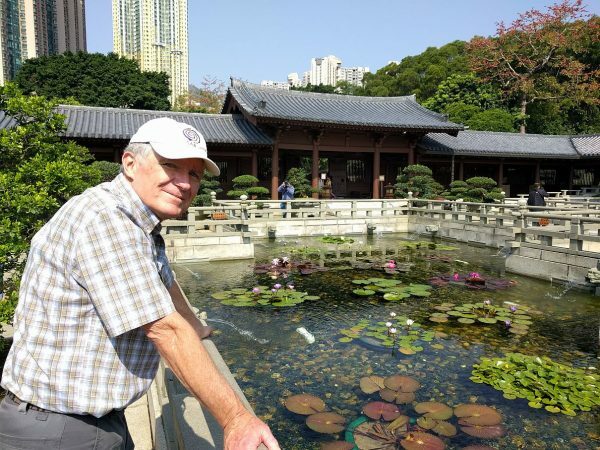 We really didn’t have any major plans in Hong Kong and just made it up as we went. It was stupidly easy to get around on the excellent Hong Kong Metro, and also cheap. Since the official languages of Hong Kong are Cantonese and English, language wasn’t a problem, and signage was in both languages. Yes, there ARE areas that look like what you think Hong Kong should look like. 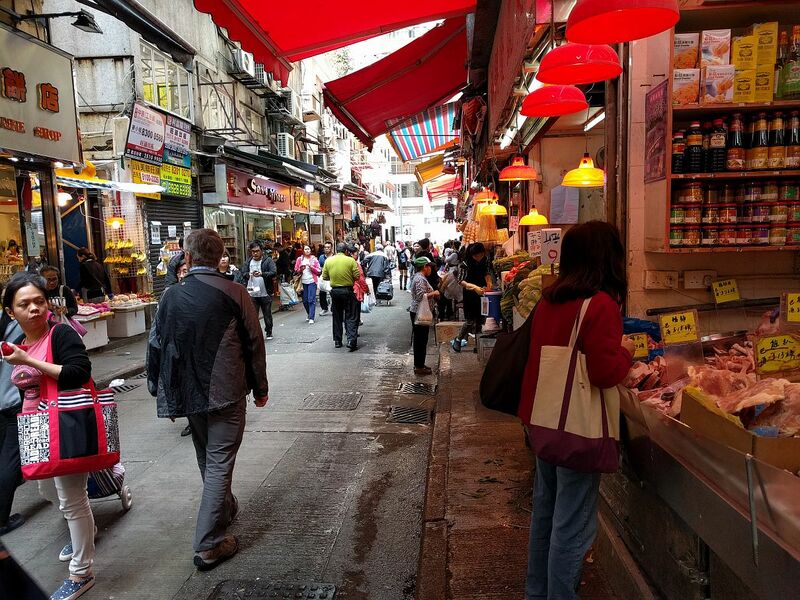 This was the Wan Chai area, maybe a half mile from our hotel….if you could figure out how to get there. 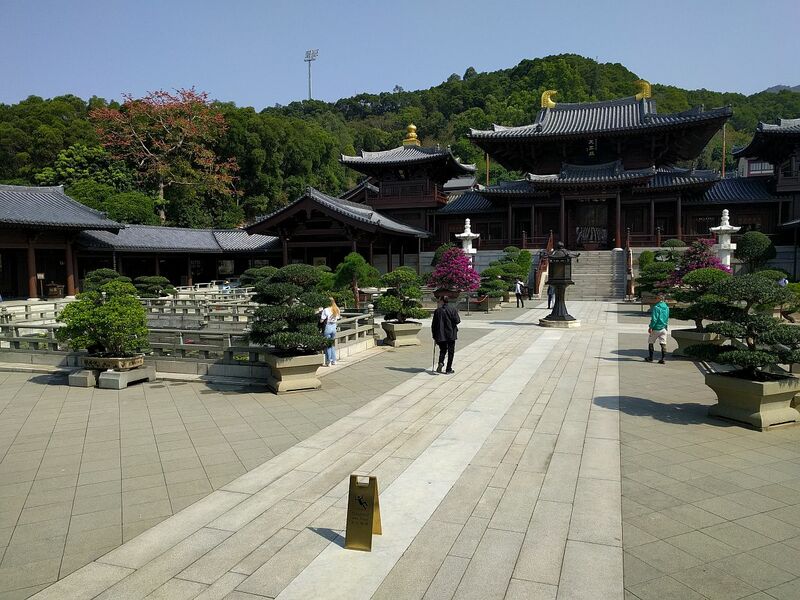 The Chi Lin nunnery, surrounded by busy Hong Kong. A very peaceful place to visit. And free! Still at the nunnery, and Jeri keeps insisting on taking my picture. The Lilypads look much better. 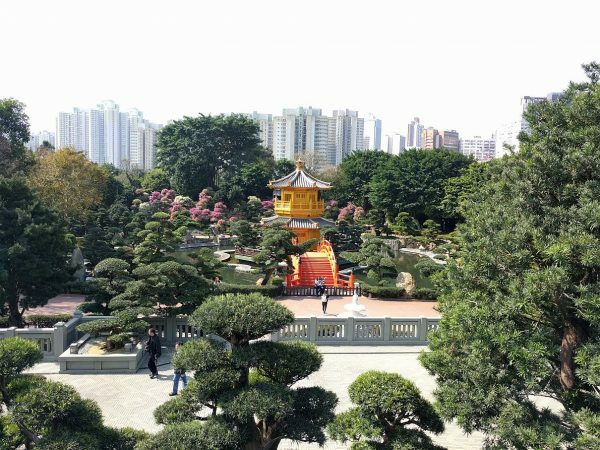 The Nan Lian Gardens, next to the nunnery. This was an easy hop on the Metro from our hotel. Hell, anything was an easy hop on the Metro from our hotel. 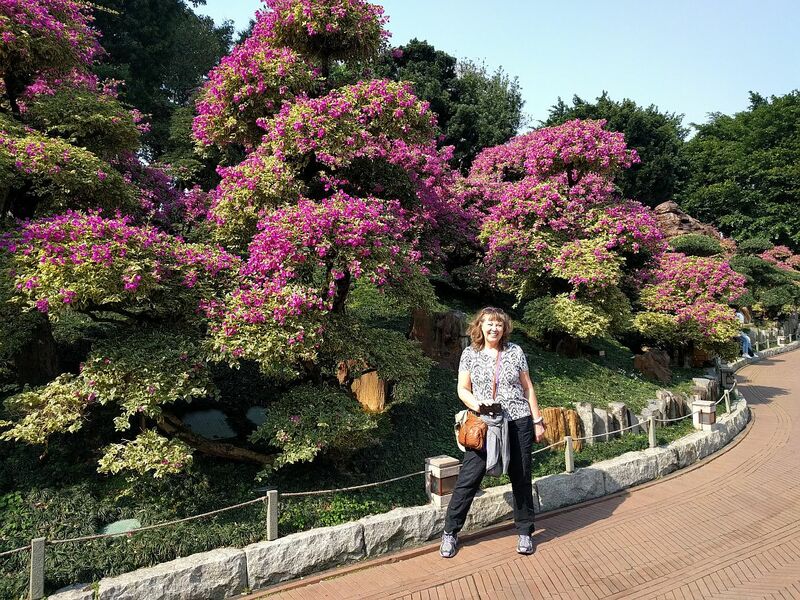 Some random tourist in the Nan Lian Gardens. 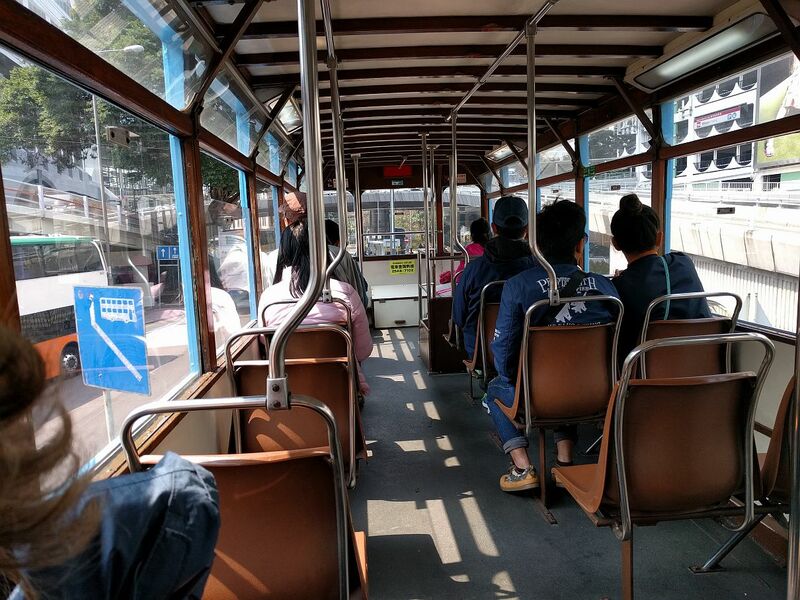 The interior of one of Hong Kong’s trams, AKA the “Ding Dings”. These are the technological polar opposite of the excellent Metro system, but they were fun to ride, cheap and the upper level gave great views of the street. We didn’t really care where we went, just as long as we were riding one. 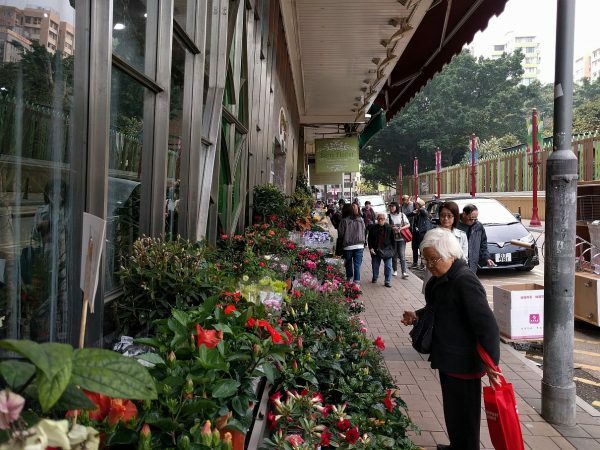 Wandering around the older portions of Hong Kong, we came upon the flower district, one of the best smelling parts of town. The architecture of the city was phenomenal. 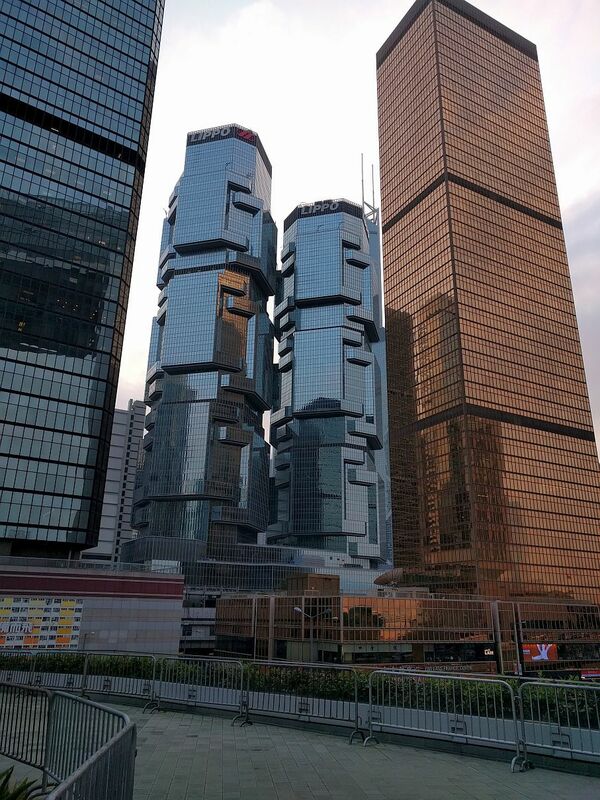 I’ve never seen such imaginative buildings. And on top of striking designs, many buildings were outfitted with LEDs that put on dazzling light shows after dark. A couple of evenings we walked down to the waterfront and just sat and watched the buildings twinkle. Just a small sample of the friggin’ amazing buildings making up Hong Kong. Hey, we’re the USA….Why can’t we have neat things like this?? A bit of Hong Kong’s amazing LED light show, viewed from the waterfront. This picture fails to convey the animation though. Hong Kong is a city of malls. They just go on and on. Sometimes it’s hard to tell where one mall ends and another begins. The folks of Hong Kong must be very serious shoppers. We enjoyed the food quite a bit more than Tokyo as there were more western options. What can I say other than we are culinary pussies. It took us a couple of days to clue in to all the elevated walkways that snake through town. In many places you just don’t walk on the street, but use the overhead walkways instead. Some of them pop through buildings, passing through lobbies before continuing on. Google maps was pretty poor in accurately rendering the routes of these things, but then I discovered detailed maps of the walkways in many of the Metro stations. A few phone photographs later, I had copies of the walkways I could take with us. Hah! 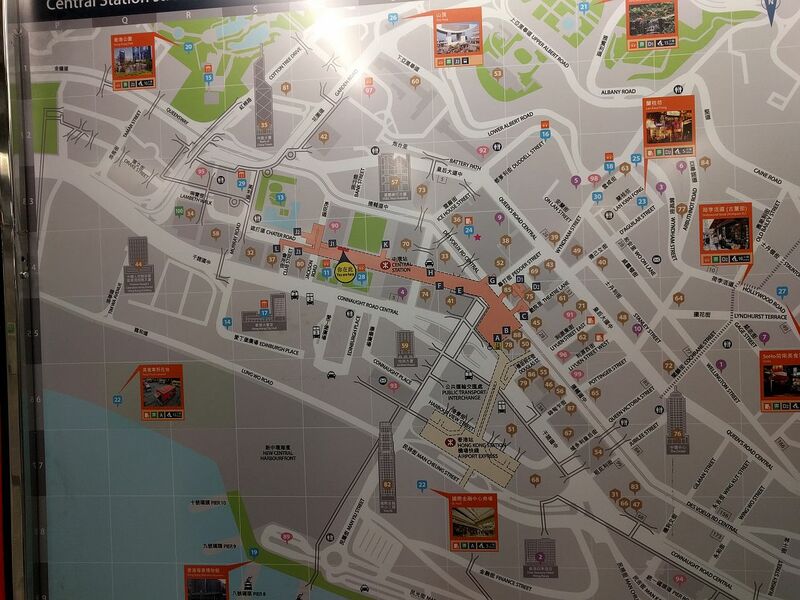 Secret information…..A map of the walkways in the vicinity of the Central Station in Hong Kong. That one running all the way down to the waterfront in the lower left was especially fun! Riding the Star Ferries between Hong Kong and Kowloon was a lot of fun, cheap and provided a good view of the harbor skyline. I can’t remember how many times we did the crossing. A Star Ferry at the Kowloon dock. Passing another ferry, mid-crossing. Unfortunately much of our stay experienced this murky haze which compromised the view, so we never bothered going up to Victoria Peak. Jeri and I both enjoyed Hong Kong quite a bit, somewhat to our surprise, but we probably wouldn’t go back. It is, after all, a huge city, and we’re not big city people. But it’s such an unusual place that’s so safe and clean, we’d highly recommend it as a place to visit at least once.